Caitlyn Luthman accounts for one of two seventh inning Versailles Lady Tigers home runs against Fort Loramie. VERSAILLES – The Versailles Lady Tigers dropped a 10-7 Saturday softball game to the visiting Fort Loramie Lady Redskins. Versailles fell behind early giving up 5-runs in the second inning and a 3-run third to trail by an 8-0 score. Both teams plated single runs in their half of innings five and six sending the game to the seventh and final inning with the Lady Tigers looking at a 10-2 deficit. The Versailles girls kept the visitors off the board in the top of the seventh before plating 5-runs in the bottom of the inning for a 10-7 final score. Both teams accounted for 11-hits in the game while the Lady Redskins were committing 3-errors on the day and Versailles 9-errors. Caitlyn Luthman and Lauren Monnin each hit home runs for the Lady Tigers in the seventh inning. Hannah Barga, Faith Huddle, Makenzie Knore and Luthman all had two hits to lead Versailles at the plate. 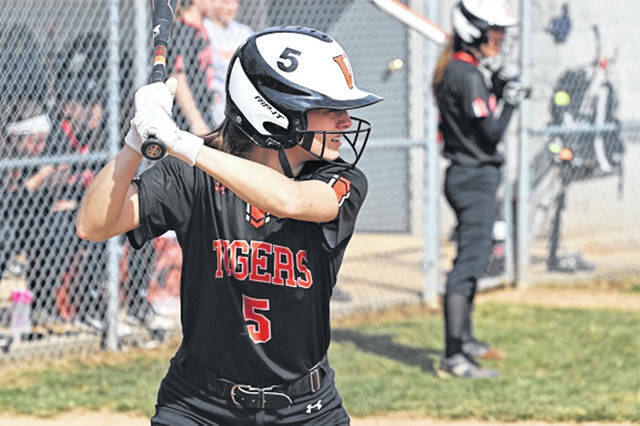 https://www.dailyadvocate.com/wp-content/uploads/sites/34/2019/04/web1_8-inch-Luthman.jpgCaitlyn Luthman accounts for one of two seventh inning Versailles Lady Tigers home runs against Fort Loramie.